It is a city where the beer is cheaper than water, bars are guarded by big-busted ghosts and food is…everywhere. 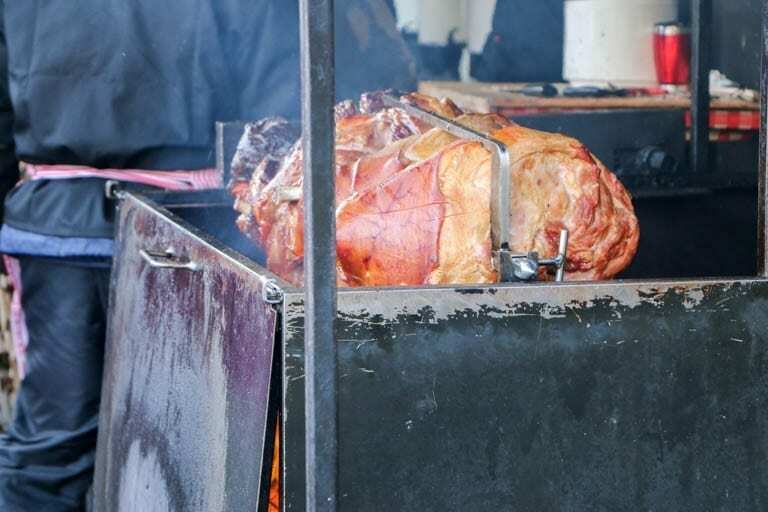 By food, I mean the stick-to-your-ribs, cabbage-soup-in-a-bread-bowl, whole-grilled-pig kind of grub. The Czech people are a hardy bunch. They love to eat outside – even when it’s really cold, as it was when I last came to visit the City of a Hundred Spires. Prague was bitter cold in late Dec. 2016 and early Jan. 2017. Clearly, I was not as hardy as the locals. 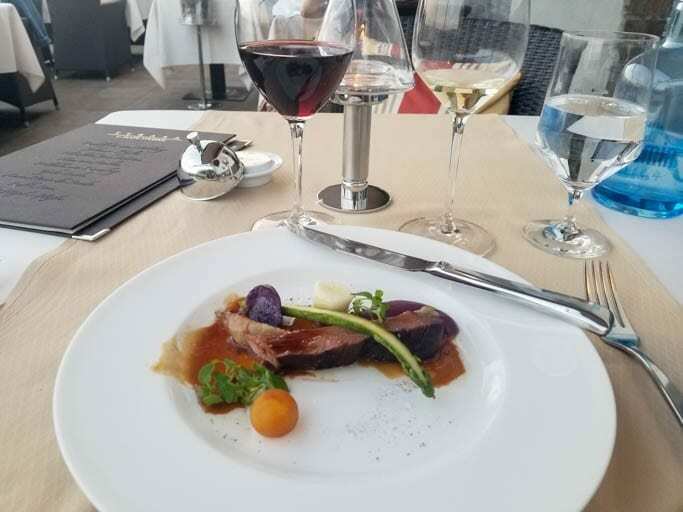 Lucky for me, this time around, the weather was perfect, and properly following in Jeff’s footsteps meant that I just had to partake in a 10-course, rooftop meal, complete with a wine pairing. Hard to be me, right? View from the restaurant at the top of the Golden Well Hotel where the Elko family ate last year. Well, in full disclosure, I actually got a bit nervous about this experience. You see, I’ve gotten good at eating alone, but a 10-course meal means I need to be really good at eating alone. Jeff’s family assured me that it would be just fine, and then surprised me by treating me to dinner – and the same epic tasting menu that they had enjoyed with Jeff a year before. I am so glad that they did because this meal is one of my favorite memories on my “footsteps” tour. Yes, it was lonely. But it was also a moment for healing, reflecting, and doing that thing that the Czechs do best: eating. Delicious course number one million, or so. Because I had previously photographed all sides of Prague, I mostly left my camera at home, and, frankly, I think I saw a lot more this way. What I didn’t see was the famous Astronomical Clock in Old Town, because it was undergoing maintenance. So, here’s an old picture of me at the clock. Nailed it. It sounds clichéd, but Old Town is magical. Unlike so many European cities, Prague wasn’t as damaged in World War II, so the square is well, old. A market place since the middle ages, this very square has seen its fair share of coronations, celebrations, parades and executions. In fact, 27 Prague nobleman and leaders of a rebellion were executed right here by the Old Town Hall in 1621. There are 27 crosses on the ground to mark the spot. 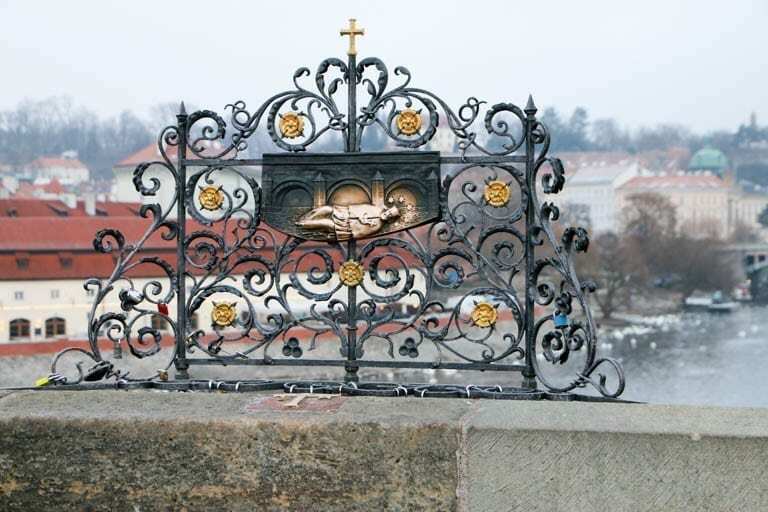 The heads of the noblemen were displayed on the Charles Bridge for years and, legend has it, that the heads return each year on the June 21st anniversary. The square is also interesting for a certain obsession with time. The Astronomical Clock (when not undergoing maintenance) is famous for the hourly “walk of apostles,” featuring moving figurines, including a skeleton representing death who strikes the time. 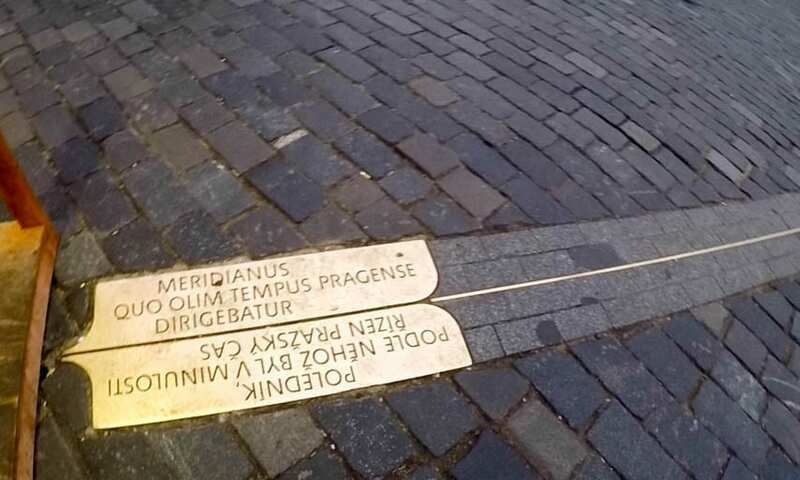 In addition, if you shift your gaze down instead of up, you can spot the Prague Meridian – the mark where a column used to cast its shadow at exactly noon. This is the way time was once measured. Speaking of time, Prague is a late-night kind of town, which means that the cafes start to consider opening at 10 in the morning. 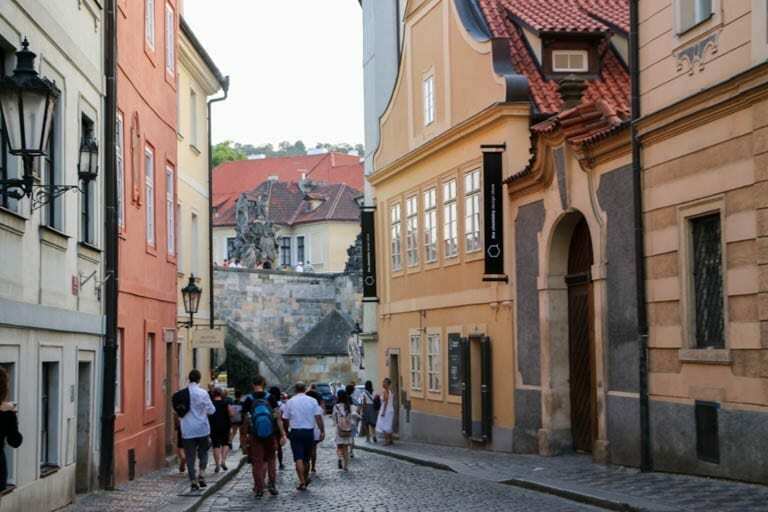 I like to get up early in Prague so that I can enjoy Old Town and the winding Karlova Street that leads to the famous Charles Bridge, all to myself. Approaching Charles Bridge from the Old Town side, you are welcomed by the bridge’s namesake and commissioner, Charles IV. First the King and then the Holy Roman Emperor, Charles spoke five languages and certainly had a knack for bridge building. He also must have had a sense of humor, because people say that from this view, it looks a little like the Emperor is, well, peeing on all of the tourists. What do you think? Is Charles peeing on the masses? 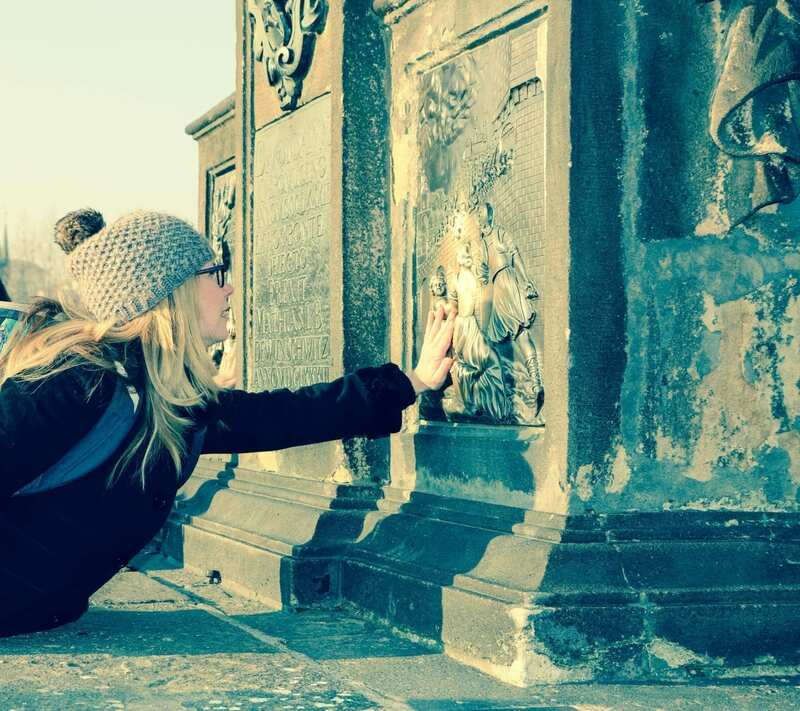 Once on the bridge, it is a must to make a wish on the small plaque marking the place where it’s said that St. John of Nepomuk was thrown into the river in 1393. People say that a wish made here, while touching the cross, will come true within a year and a day. I can attest to this legend. I wished for true love at this spot in early Jan. of 2017 and fell for Jeff in August of 2017. 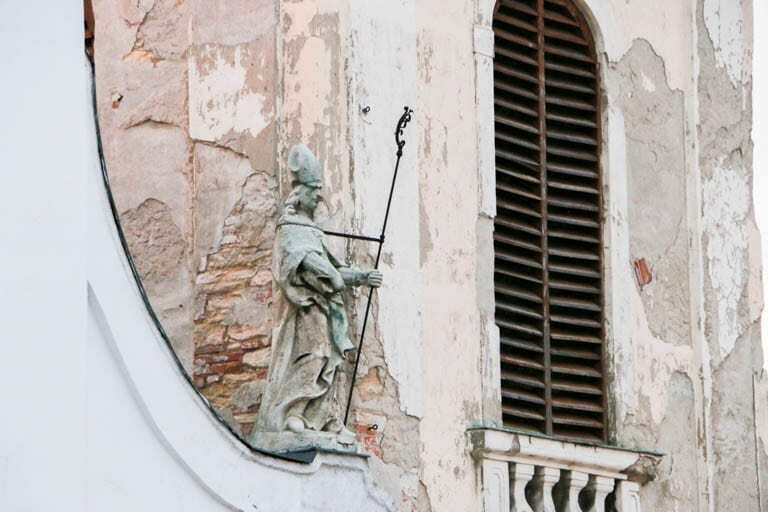 John of Nepomuk is the Patron Saint of good confessions – and for good reason. The legend is that he was thrown in the river because he wouldn’t tell the King of Bohemia the confessional secrets of the Queen. It’s also said that stars appeared above the water where his body landed, which is why the statue of the saint himself – just a few feet away from his plaque – is depicted with stars. This statue also brings a lot of wishers. It’s said that touching the falling priest on the saint’s statue will bring good luck and ensure a return to Prague, which also worked for me! Wishing for a return to Prague, but not expecting to return quite so soon. Moving on down the bridge, each of the ornate statues has the ability to fascinate, but everyone seems to have their own favorite for different reasons. Sunrise on the Charles Bridge in early 2017. 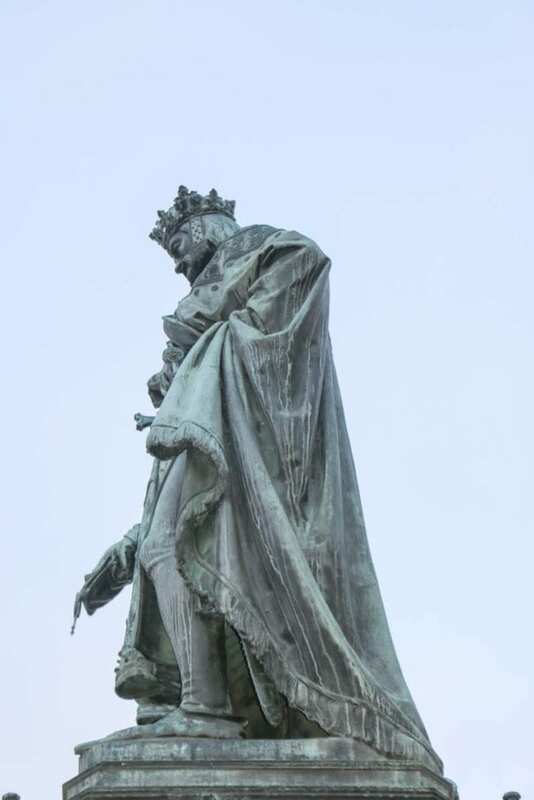 My favorite statue on the Charles Bridge. 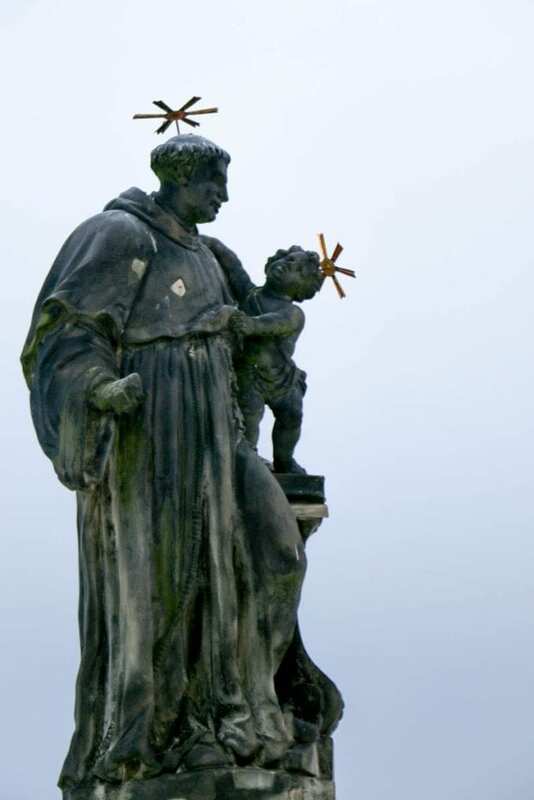 Mine is St. Anthony of Padua because of his propeller hat. He is also the Parton Saint of Lost Things and, truth be told, I have seen him throughout my travels in Europe, which might mean that I am lost. But, fear not, Saint Anthony has found me time and time again. St. Anthony peering into my balcony window in Budapest. Most people head up to the castle grounds after pondering the statues on the bridge, but I like to take the first sharp right to explore the hidden treasures of what’s called the Little Quarter. My favorite little part of this neighborhood is Shakespeare and Sons, the bookstore filled with English-language books. It is a sister store to its famous Paris counterpart. When Jeff told me about his trip to Prague, I told him that if he had he taken a right at the end of the bridge, instead of a left, he would have found this famous spot. 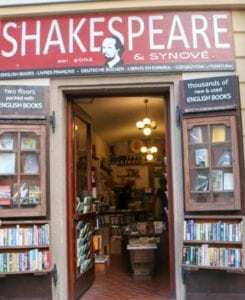 Given his love of bookstores, he vowed to come back to Prague and find it. I like to think that I brought him with me. Just after the bookstore, there is this tiny little alley that even has its own pedestrian street signals. 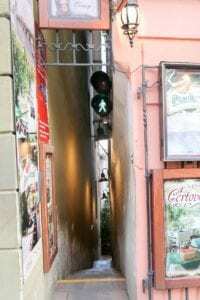 The narrowest street in Prague. And, finally, just around the corner, there is the courtyard of the Franz Kafka Museum, where the sculpture called “Piss” holds court. Yep, Piss. 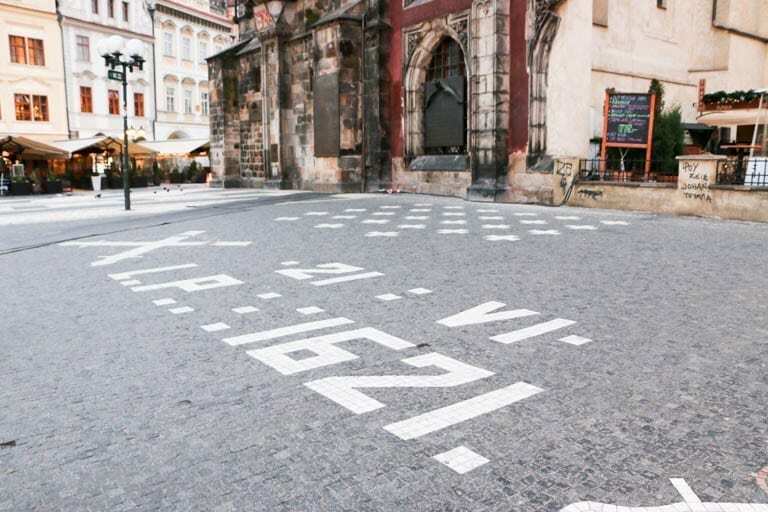 These guys are actually peeing on a map of the Czech Republic. Me with the Piss sculpture and fountain in early 2017. 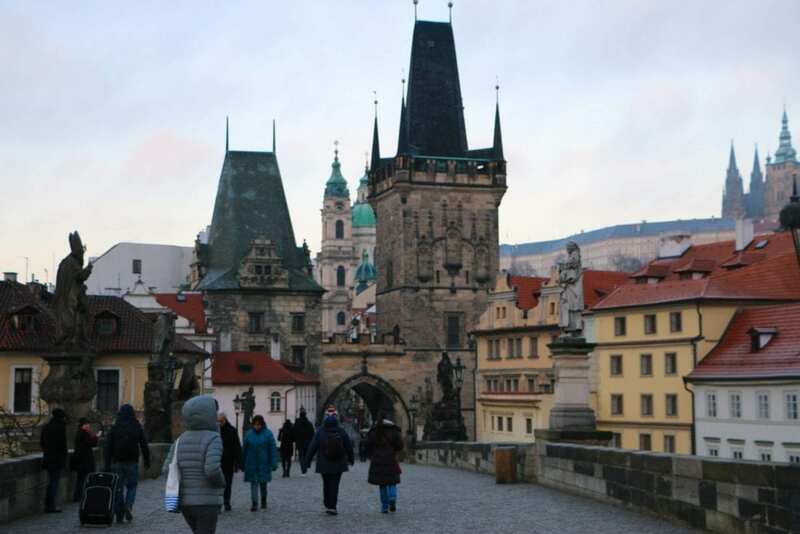 So, if you’re following, that means that the Charles Bridge begins and ends with….pee. 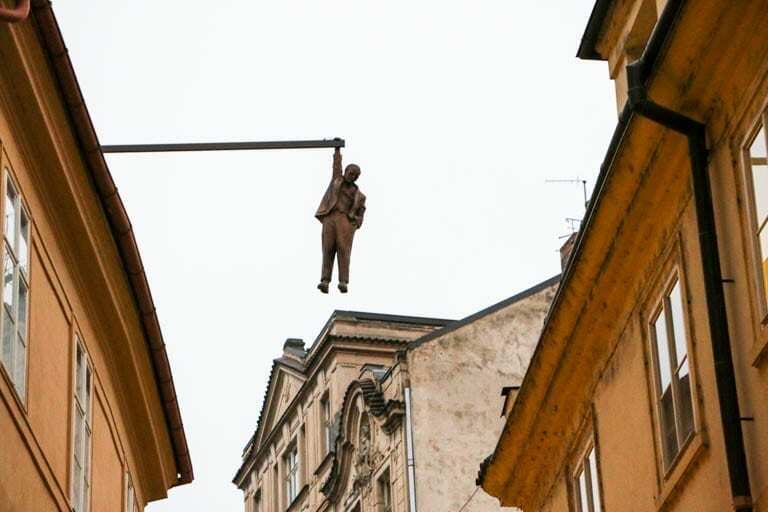 On a serious note, the Piss artist David Cerny has a lot of interesting and eye-popping creations throughout Prague including the Hanging Man back in Old Town. “Man Hanging Out” is Černý’s depiction of Sigmund Freud suspended by one hand. 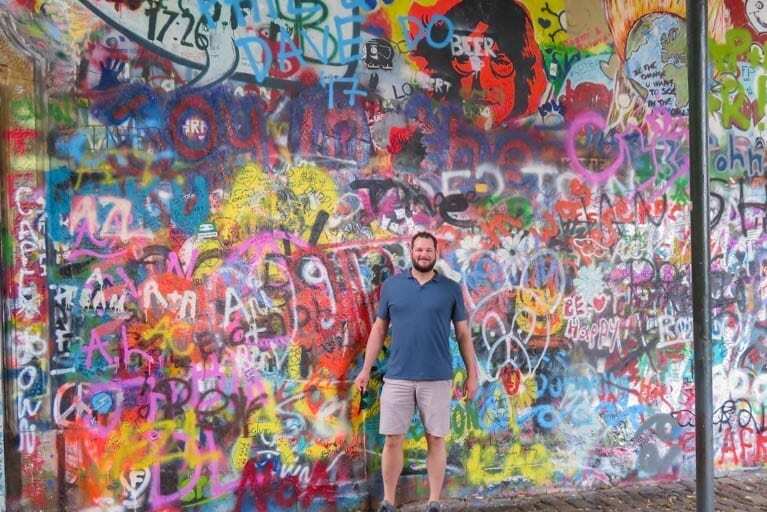 If like Jeff, you hang a left, rather than a sharp right after the bridge, you’ll find what was one of Jeff’s favorite things about Prague: the Lennon Wall. The wall has been painted over time and again, but tributes to John Lennon, the Beatles, and peace always come back in colorful variations. Jeff at the Lennon Wall last year. 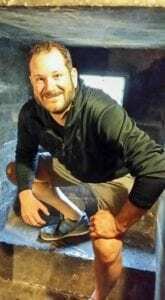 Jeff at the Powder Tower. I’ve always loved the picture of Jeff hiding in a nook ready to surprise his family, and it was fun to find the place where it was taken. The clue I was given from the Elko family was to climb the tower near the Hotel Paris where they had stayed. I grabbed a cocktail in the Hotel Paris bar and took to Google Maps to find the nearby Powder Tower. Originally a place to store gun powder (hence the name), the Gothic tower stretches over the street where the coronation processions of Bohemian kings first entered the city walls. I found the spot and, seeing that others had scratched their initials into the wall, I committed my first act of vandalism. 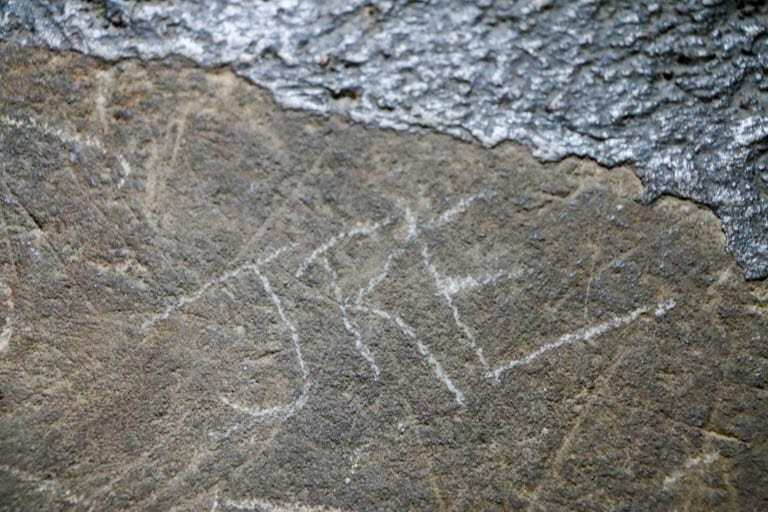 Jeff’s initials at the Powder Tower nook. What was that about Big-Busted Ghosts? I closed out my Prague trip with a visit to my very favorite restaurant in the city. 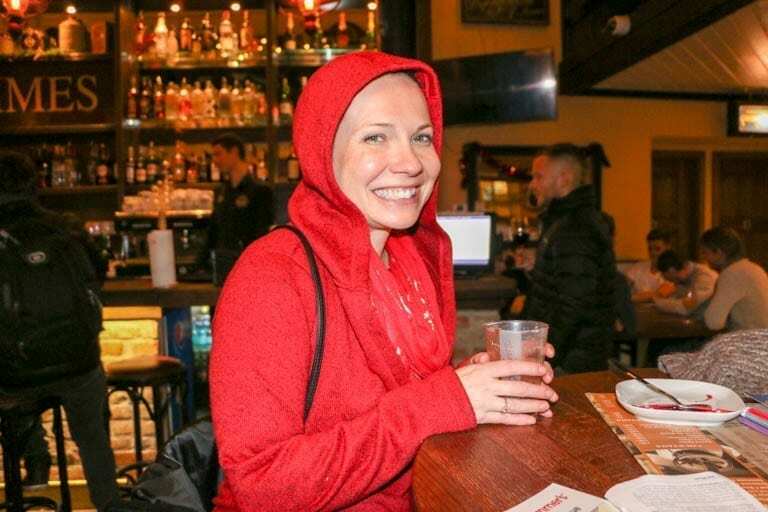 U Provaznice, or the Restaurant of the Rope-Maker’s Wife, is said to be haunted by the beautiful woman who once owned the bar. Legend has it that her husband got jealous of all the goings on at the bar and strangled her with a rope. Today, it’s a perfectly pleasant place filled with good food, good beer and lots of locals. Though…people do still touch the portrait of the rope-maker’s wife if they need a little luck in their relationships. On this trip to Prague, and my final stop on the “footsteps” tour, I didn’t touch the portrait of the rope-maker’s wife. I didn’t feel that I needed any luck at all. 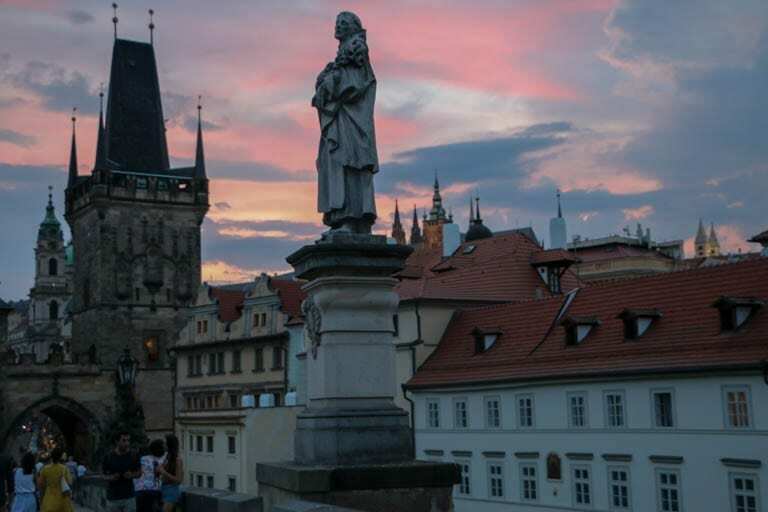 Since my last trip to Prague when I wished for love on both the Charles Bridge and with the rope-maker’s wife, I have found it – and I have lost it. But I am forever grateful for all the gifts that Jeff’s love continues to bring. I just caught up on your journey after seeing all the bike pics on Instagram. I love all the stories about the signs! 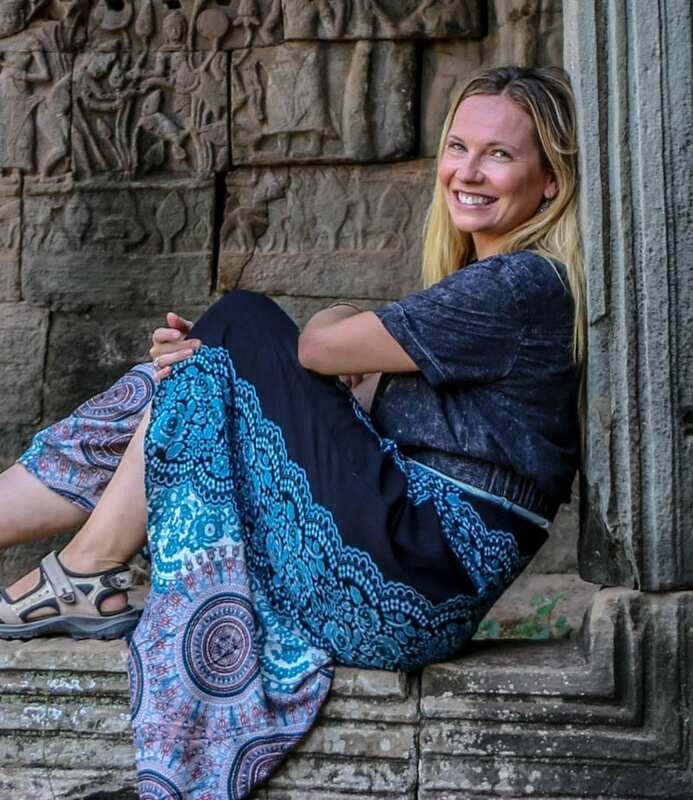 I hope you will continue to share your journey and am excited to learn more about your book. Thank you for sharing and inspiring. Loved it. What a journey. Thank you, Sheila! I really appreciate your support during this difficult time. So much love to you, Jen. Thank you for sharing your journey! Thank you for following along, Cindy. Hugs.